Finally, Chevrolet unveils the ultimate ZR1. The Chevrolet Corvette ZR1 is the epitome of Corvette's performance legacy. Powered by a supercharged V8 6.2L LS9 engine, the car delivers the power of 638 horses and max torque of 604 lb-ft. The engine powerful enough to drive the car to an electronically limited top speed of 205 mph - fatest production Corvette speed till date! 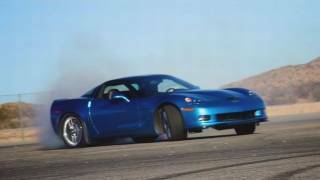 Chevy's Ed Pepper claims Corvette ZR1 2012 is better than the Porsche 911 GT2, the Ferrari 599 and even the Lamborghini MurcielagoLP640. The ZR1 is the ultimate expression of Corvette’s technology-driven performance legacy. A supercharged 6.2L LS9 engine and suite of advanced performance technologies, including Performance Traction Management and Magnetic Selective Ride Control, are the elements of the highest-performing Corvette in history, with changes for 2012 designed to make it more comfortable to drive. 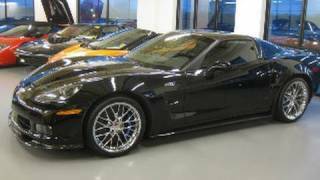 Corvette ZR1 is the fastest production model ever offered by General Motors, with a top speed of 205 mph. Capability of the ZR1 is enhanced for 2012 with the new PDE ZR1 High Performance Package, which is highlighted by new Michelin® Pilot® Sport Cup Zero Pressure tires. When combined with new-for-2012 Performance Traction Management (PTM) technology – which manages torque delivery for maximum performance – the tires are expected to help set new benchmarks for Corvette performance. Engineers estimate an 8-percent gain in maximum lateral acceleration, to more than 1.1g, and improved braking distance. The PDE package’s effectiveness was demonstrated with a new lap time of 7:19.63 around Germany’s legendary Nürburgring, which improved on the ZR1’s previous benchmark there by more than six seconds. Corvette ZR1 also celebrates Chevrolet’s performance heritage with the 2012 Chevrolet Centennial Edition Corvette, which features a sleek black colour scheme, unique design elements and Corvette’s sports car technology. The special package is inspired by Chevrolet’s racing-bred foundation and is offered on all Corvette models for 2012. 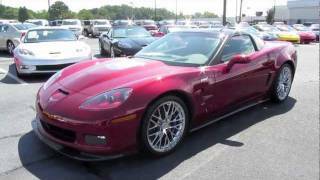 Corvette ZR1 for 2012 includes interior improvements shared with all Corvette models, including new seats, a new steering wheel design and a new Bose Premium audio system. Customers who opt for the Corvette Engine Build Experience can participate in the assembly of their engine at the General Motors Performance Build Centre, in Wixom, Mich.
Fixed-roof body style optimizes body rigidity and mass; offered in two trim levels – 1ZR and 3ZR. Wider, carbon-fibre front fenders with ZR1-specific dual ports. Carbon-fibre hood with a raised, polycarbonate window – offering a view of the intercooler below it. Carbon-fibre roof panel, roof bow, front fascia splitter and rocker mouldings with clear-coated, visible carbon-fibre weave. Two new exterior colours for ’12: Carlisle Blue Metallic and Carbon Flash Metallic (Chevrolet Centennial edition only). Also offered are Arctic White, Blade Silver Metallic, Inferno Orange Metallic, Velocity Yellow Tintcoat, Torch Red, Supersonic Blue Metallic, Cyber Gray and Crystal Red. New customer-selectable brake calliper colours offered in red, yellow, silver and grey (blue callipers are standard). Unique Centennial Satin Black wheels with red stripe, sized specifically to the respective Corvette models, including 19-inch/20-inch for ZR1. Ebony leather-wrapped instrument panel and doors complemented by red stitching also on the steering wheel, seats, console and shifter. The seats feature microfibre suede accents on seats, steering wheel, shifter and armrests. New seats feature improved appearance and larger bolsters on the seat back and cushion areas to provide better driver support, especially in high-performance driving. Microfibre seat inserts are optional. New Bose Premium audio system includes nine speakers (vs. seven in 2011), including new tweeters located in the instrument panel and improve Bose Nd next-generation bass performance. It is included with the 3ZR trim. An onboard navigation system with voice recognition is included with 3ZR. It is a DVD-based system that uses a 6.5-inch (165 mm) colour touch-screen display. Head-up display is standard and includes Track Mode with g-metre. Specific gauge cluster with boost gauge (also displayed on the head-up display) and 370 km/h (220-mph) speedometer readout. A custom leather-wrapped interior package is standard on the 3ZR trim, featuring a leather-wrapped upper and lower instrument panel, door pads and seats; choice of exclusive colours: Dark Titanium, Ebony, Cashmere or Sienna, with unique colour breakup; padded door panel armrests; “Corvette” embroidered on passenger-side dash pad and a unique centre trim plate with a gunmetal pattern. LS9 supercharged 6.2L V-8 rated at 638 horsepower (476 kW), and 604 lb.-ft. of torque (819 Nm). The Roots-type supercharger uses a unique, four-lobe rotor design and is augmented with an integrated charge cooling system that reduces inlet air temperature for maximum performance. Cast iron cylinder liners are inserted in the aluminum block and are finish-bored and honed with a deck plate installed. The deck plate simulates the pressure and minute dimensional variances applied to the block when the cylinder heads are installed. The LS9 is hand-assembled at GM’s Performance Build Centre in Wixom, Mich., and incorporates special processes typically seen in racing engines to produce a highly refined and precise product. High-capacity dual-disc clutch, which spread out the engine’s torque load over a wider area. This enables tremendous clamping power when the clutch is engaged, while also helping to dissipate heat better and extend the life of the clutch. The rear axle features asymmetrical axle-shaft diameters – 33 mm on the right side and 40 mm on the left – that provide optimal torque management. They are mounted on a more horizontal plane that correlates with the wider width of the ZR1’s rear wheels and tires. Specific suspension tuning provides more than 1g cornering grip. Twenty-spoke 19-inch front and 20-inch rear wheels. Michelin Pilot Sport 2 tires – P285/30ZR19 in front and P335/25ZR20 in the rear – developed specifically for the ZR1. Brembo carbon-ceramic, drilled disc brake rotors – 15.5-inch-diameter (394-mm) in the front and 15-inch-diameter (380-mm) in the rear. Magnetic Selective Ride Control with track-level suspension. Launch Control system with Performance Traction Management (PTM) technology optimizes traction for greater and more consistent on-track performance. PTM system holds a predetermined engine speed while the driver pushes the throttle to the floor. That allows the driver to quickly release the clutch and the system modulates engine torque 100 times per second to maximize the available traction. The system is capable of approaching a skilled driver’s best effort and repeats it consistently. PTM also integrates the ZR1’s traction control, active handling and selective ride control systems to enhance track driving consistency and overall performance. When full throttle is applied upon exiting a corner, it automatically manages acceleration dynamics. A magnesium cradle serves as the attachment point for the engine and some front suspension components. It is lighter than aluminum, yet incredibly strong, and helps improve the front-to-rear weight distribution, as do carbon-fibre front fenders and wheelhouses. Large wheels, measuring19 x 10 inches in diameter in the front and 20 x 12 inches in the rear. A Sterling Silver paint finish is standard; chrome and Competition Grey versions are optional. ZR1-specific Michelin Pilot Sport 2 tires measuring P285/30ZR19 in front and P335/25ZR20 in the rear. Brembo carbon-ceramic brake rotors. Made of a carbon-fibre-reinforced ceramic silicon carbide material, these rotors are low mass and resistant to wear and heat. The rotors should never show corrosion or require replacement for the life of the vehicle, when used in normal driving. Six-piston front callipers and four-piston rear callipers, each painted ZR1-specific blue. Standard Magnetic Selective Ride Control helps the rear axle remain planted during launch for smooth, hop-free acceleration. It also helps suppress axle movement when cornering on broken or uneven pavement. New Michelin® Pilot® Sport Cup Zero Pressure tires, developed by the same Michelin engineers who develop tires for Corvette Racing in the American Le Mans Series and are essentially street-legal versions of a racing tire. The 285/30-19 (front) and 335/25-20 (rear) tires are matched with all-new aluminum Cup-style wheels in satin black or machined finishes. They are about five pounds lighter (2.2 kg) and stronger than the 20-spoke wheel offered in 2011. A full-width racing style spoiler for improved aerodynamics. Tire pressure monitoring system and run-flat tires arestandard on all models. Standard remote keyless entry with push-button starting. 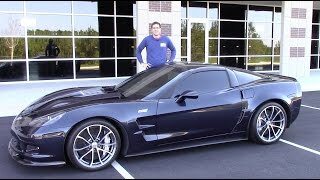 Corvette ZR1 is offered with OnStar as standard on all models. It uses GPS and cellular phone technology to automatically call for help in the event of crash. OnStar subscribers also can use the service to be Good Samaritans by sending help to other motorists, and to call for help in other non-crash emergencies.